Back in January of this year Greentech Media published a long list of VC funded and early-stage solar firms. They called it "150 Solar Startups" because the total number of firms was in that ballpark and it had a bit of a ring to it. But, writes Eric Wesoff on the Greentech blog, "as we kept looking and as our readers continued to bring more firms to our attention the numbers climbed – first past 200 and settling in at a grand total of 219. Subtracting newly departed SV Solar and Optisolar leaves us with 217 solar firms hatched in the last few years." Epic Change is terrific social enterprise started by social entrepreneurs Stacey Monk and Sanjay Patel. I've been watching and supporting Epic Change in various ways over the past year and a half and am exceedingly impressed with their results-oriented, innovative approach. Readers of the green skeptic know that stories are important to me; in fact, I've written extensively about the power of stories to change the world and have developed and led workshops to help organizations learn how to tell their stories more effectively. Epic Change helps hopeful people in need share their stories to acquire resources that will improve their lives. They believe that people's stories are assets that can be used as pathways out of poverty. They help people in need share their "epic," true stories in innovative, creative, and profitable ways to help them acquire the financial resources they need to create positive "change" in their communities. Stacey and Sanjay's story has been told very well in a variety of places such as here and here. And they are leaders in using social media to spread the word about social change. Now Epic Change has an opportunity to win USD$10,000 through the IdeaBlob competition currently up at idealblob.com. But this isn't just about winning the money. As with everything I've seen from Epic Change, it's about OUTCOMES. Epic Change plans to build a technology lab at a locally led primary school in Tanzania so that children, teachers, and parents in the community can access a whole new world of information and enter global conversations by using social media to share their stories online. Already, the school's founder, Mama Lucy, is blogging on the Epic Change site (Updates from Mama), and even has a Facebook page where she's already posted a note asking folks to begin voting tomorrow. According to Stacey, they've had "20 great laptops donated and have procured basic software through TechSoup - now we just need to get the computers to Tanzania, build a facility that will also serve as the school's first library, and imaginatively get this remote classroom access to the web." So, what are you waiting for, got to IdeaBlob.com and vote for Epic Change. The Associate Press (AP) reported this morning that "President Barack Obama's proposed new fuel and emission standards for cars and trucks will save billions of barrels of oil but are expected to cost consumers an extra $1,300 per vehicle by the time the plan is complete in 2016. Today, Obama will announce the first-ever national emissions limits for vehicles, including an overall average of 39 miles per gallon for cars and 30 mpg for trucks by 2016. According to AP, Obama's plan effectively puts an to the feud between automakers and statehouses over emission standards and "couples for the first time pollution reduction from vehicle tailpipes with increased efficiency on the road. It would save 1.8 billion barrels of oil through 2016 and would be the environmental equivalent to taking 177 million cars off the road, senior administration officials said, speaking anonymously ahead of the announcement." I'm still looking for some data to back up these claims, but I agree that raising these standards is long overdue -- and may even spur innovation. Read the AP story here: Emissions. We need to introduce simple arithmetic into our discussions of energy. We need to understand how much energy our chosen lifestyles consume, we need to decide where we want that energy to come from, and we need to get on with building energy systems of sufficient size to match our desired consumption. Our failure to talk straight about the numbers is allowing people to persist in wishful thinking, inspired by inane sayings such as "every little bit helps." Assuming we are serious about getting off fossil fuels, the scale of building required should not be underestimated. Small actions alone will not deliver a solution. Let's express energy consumption and energy production using simple personal units, namely kilowatt-hours. One kilowatt-hour (kWh) is the energy used by leaving a 40-watt bulb on for 24 hours. The chemical energy in the food we eat to stay alive amounts to about 3 kWh per day. Taking one hot bath uses about 5 kWh of heat. Driving an average European car 100 kilometers (roughly 62 miles) uses 80 kWh of fuel. With a few of these numbers in mind, we can start to evaluate some of the recommendations that people make about energy. Read his full commentary here. Professor MacKay's book, "Sustainable Energy - Without the Hot Air," is published by UIT Cambridge and is also available in electronic form for free from http://www.withouthotair.com/. "A few years ago I was involved in the design of a green building at Drexel University called the Drexel Smart House," says Jameson Detweiler, CEO of Konnect.me. "Designing the house proved to be very frustrating at times. Finding information about previous buildings and building products, related to sustainability, was a time consuming and frustrating process." Detweiler's experience was not an isolated case. For anyone embarking on a green building or renovation project, access to quality information is key. Understanding the various certifications and product claims and even finding installers, suppliers, or others who have undertaken similar projects can be an unnerving experience. "There were so many different types of product certifications, manufacturers all made different claims, and this information was distributed across thousands of sources," Detweiler relates. "To say the least, it was very confusing. This is why we decided to start Green.Konnect.me. We needed a place where all of this information was available, a place for the green building community to both visit and participate in on a regular basis." 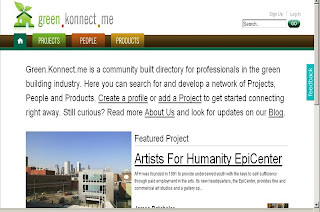 Detweiler's Philadelphia-based startup dedicated to reinventing the B2B portal, Konnect.me, announced today it is launching Green.Konnect.me, a community built directory for professionals in the green building industry. The goal of Green.Konnect.me is to provide accurate and comprehensive information regarding "Products, Projects, and People" in the green building industry. Detweiler believes "that the greatest advances in sustainability can only be achieved by the transparent sharing of knowledge and ideas." Prior to founding Konnect.me, Jameson worked as the CEO of Summalux, LLC, an LED Lighting Research Firm, which won first prize in the Laurence A. Baiada Center for Entrepreneurship's 2008 Incubator Competition at Drexel's LeBow College of Business. I've watched Detweiler and his partners over the past eight months or so as they have developed Green.Konnect.me as part of Konnect.me, which they founded in 2008 to "revolutionize B2B information access and delivery." It's an easy-to-use platform that helps address a critical problem for those interested in green building. Very exciting to see it launched today. So What's a Smart Grid Anyway? It's More Power to Ya. What is a Smart Grid? Perhaps it is easier to start with what a Smart Grid is NOT. A Smart Grid is not a bunch of one-way meters spinning around as you consume and a guy who drives around checking the meter periodically, sometimes correcting assumptions made by your electric company about your energy consumption and sometimes not. A Smart Grid is not a grid that is subject to the whims of weather, mischievous squirrels, bird strikes or spikes in consumption by millions of users. So, what is a Smart Grid, then? A smart grid delivers electricity using digital technology that tracks power consumption with smart meters, special electrical meters that instantly transmit energy usage information to utilities via wireless networks. Smart meters also let us track our own energy use hour-by-hour on the Internet and with third-party computer programs. Basically, we're talking about real-time, two-way communication between you or your business and your utility provider. This helps manage usage and flow and consumption, can help predict spikes and shift sources rapidly in response to changing needs. And if you have solar panels, wind turbines, plug-in hybrid vehicles or any other potential generating source, smart grid technology will help you feed that into the mix, so that you become a generator, not just a consumer. The true vision of the smart grid is a self-healing, automated grid that can manage complex flows of electrons, from the hundreds — potentially thousands — of large and small sources of power to the millions of homes, businesses, industrial customers and, potentially, electric cars that require that energy. Okay, so basically, a Smart Grid is like a brain for energy distribution. Nerve endings all over your body send information back to the brain telling the brain when you are too hot or too cold; that you need more energy in one part of the body or another (exercise and eating, for instance, have different requirements in different regions of the body); and helps you regulate your every action. Many players are getting involved in the act, from the federal government, which recently allocated $3.3B to Smart Grid technology development, to start-ups and even large companies like IBM and Google. Google's PowerMeter, which they describe as being in prototype, will receive information from utility smart meters and energy management devices and provide anyone who signs up access to your home electricity consumption right on your iGoogle homepage. Essentially a Smart Grid will put more power in the hands of consumers and make them partners with utilities rather than simply customers or rate payers. In the last analysis, a Smart Grid is just what it sounds like: smart. Earth2Tech.com FAQ, which includes a list of companies working on various components for making the grid smarter. Agree to Disagree: Cap-and-Trade vs. Carbon Tax? NASA’s leading climate scientist, James Hansen, says he hopes that climate legislation proposed by Democratic Representatives Henry Waxman (CA) and Edward Markey (MA) to introduce carbon emissions trading to the United States fails. Hansen says lawmakers should abandon cap-and-trade initiatives altogether and implement a simple carbon tax instead, according to Nathanial Gronewold, a reporter at Environment & Energy Publishing. "Trading of rights to pollute...introduces speculation and makes millionaires on Wall Street," Hansen told an audience at a conference hosted by Columbia University climate policy students on Saturday. "I hope cap and trade doesn’t pass, because we need a much more effective approach." This may be a nice way to curry favor with student environmentalists, but is it smart? According to Reuters, even the Chinese are considering a carbon tax over cap-and-trade. What's the difference, really? Under a cap-and-trade program, the government will set the overall emissions cap and issue allowances or credits to businesses to pollute at a set amount. A company that reduces its emissions quickly and cheaply can auction their extra credits to another that, because of the nature of its business or available technology, may find it more difficult to comply with the caps. This market-based approach helps ensure that overall caps are met at the lowest possible cost. Cap-and-trade has been modeled after the U.S. effort to control acid rain pollution, which saw greater reductions at lower costs than originally anticipated. Under a carbon tax, such as that proposed by Rep. John Dingell (D-MI), emitters are required to pay a tax for every ton of pollution they produce. Carbon taxes lend predictability to energy prices, according to supporters, who claim that cap-and-trade systems will simply aggravate price volatility and adversely affect consistent investments in less carbon-intensive electricity generation, energy efficiency, and renewable energy. But, argue cap-and-trade supporters, such a system also provides certainty: it fixes the ceiling on emissions (stepping it down over time) and lets the price vary with demand. Despite rhetoric on both sides, neither system is really more complex than the other, as each requires often difficult monitoring and enforcement. Cap-and-trade and carbon tax do share another issue: what to do with the proceeds? The Obama administration seems to favor distributing 10 percent of the proceeds to American citizens; others, including Representative Chris Van Hollen (D-Md. ), would return 90 percent to Americans. Still others call that highway robbery. Now, Jim Hansen says we'll create a bunch of robber barons on Wall Street if we go this route. But a carbon tax will simply create bigger government, or at least help pay for the biggering and biggering the government has done since last fall. As readers of the green skeptic know, I firmly believe we won't make the shift until one of two things happens: 1.) we can make boatloads of money off of addressing the issue or 2.) oil prices go through the roof and supply plummets to worse than anticipated levels. Rep. Markey claims his Bill, the Investing in Climate Action and Protection Act (HR 6186), or iCAP, is a cap-and-invest strategy. President Obama has already included a line item for cap-and-trade in his budget, which clearly signals the Administration's preference for capping global warming pollution, auctioning all the emission allowances, and investing $15 billion per year in clean energy. Wither a tax? It's probably, as every politician knows, an idea that is dead on arrival. And it is looking less and less likely we'll get a decent cap-and-trade program in place any time soon. So, perhaps we should just focus, as blogger Gar Lipow suggested in Grist, "on pushing for green infrastructure, paid for the moment by 10-year bonds with a 3 percent interest rate." If time is money and we're running out of time, then why not support an approach that will generate more money and maybe, just maybe, buy us some time?